They say one of the hardest things about love is learning to accept it. It can be so hard to feel worthy of being loved. Yet, you can’t fully love others until you accept that you’re loveable as well. I’m in the camp of people who doesn’t get terribly into Valentine’s Day. I do love chocolates, and champagne, and flowers. But, I love them on many more days of the year than just February 14th (and I wouldn’t mind receiving them on many more days too, ahem, Joel, ahem 🙂 ). However, I’m also in the camp of people for whom, when faced with chocolate mousse, resistance is futile. Not just futile, laughable. Any resistance in the face of chocolate mousse is basically an act because I really love the stuff. Creamy, chantilly chocolate with creamy cream on top? My knees just went weak. So, when I saw this recipe for chocolate mousse floating around the digital stratosphere a couple of weeks ago – and then had it continue to pop up every where I went like an old nickname that you can’t live down – I knew it was only a matter of time (and probably not a very long one) before I would give it a try. So, why the heck not on Valentine’s Day? The genius of this recipe is its counterintuitiveness; its combination of simplicity and technique. 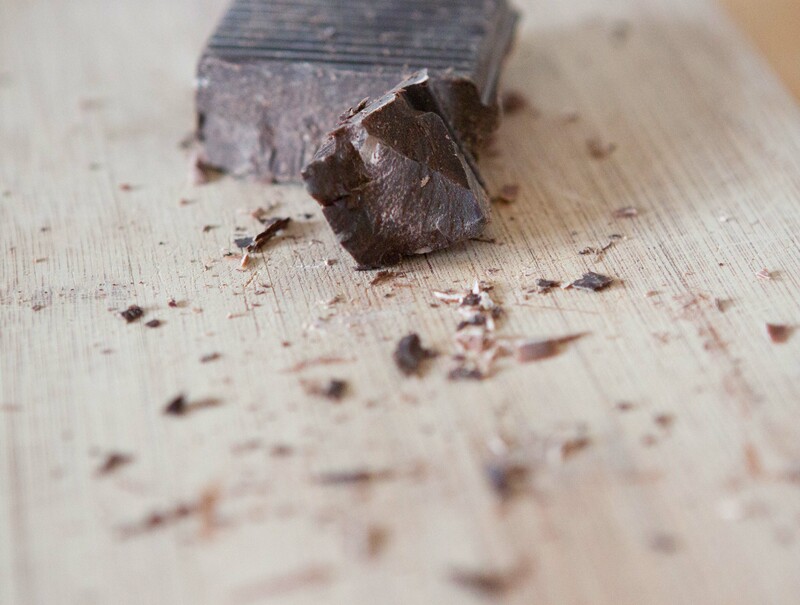 The basic recipe consists of only dark chocolate and water. (Downright healthy, right?!) 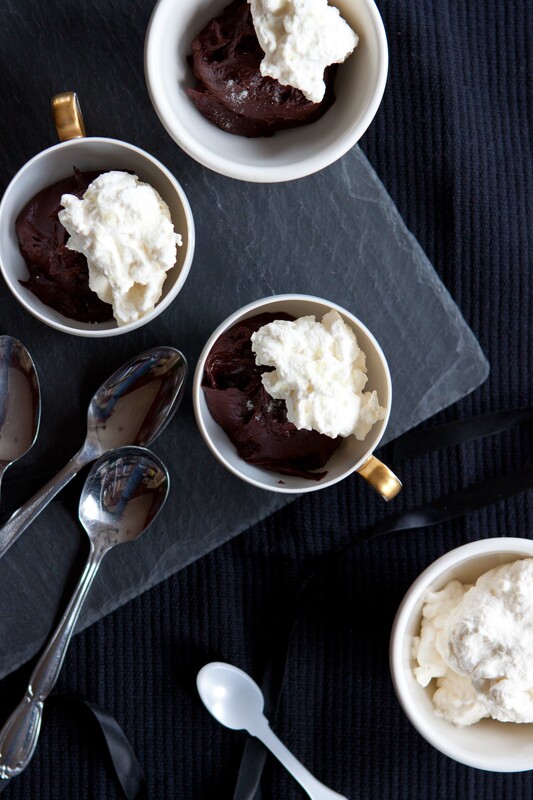 The fact that this can give you creamy ribbons of intensely chocolatey mousse is a miracle of science. Literally. 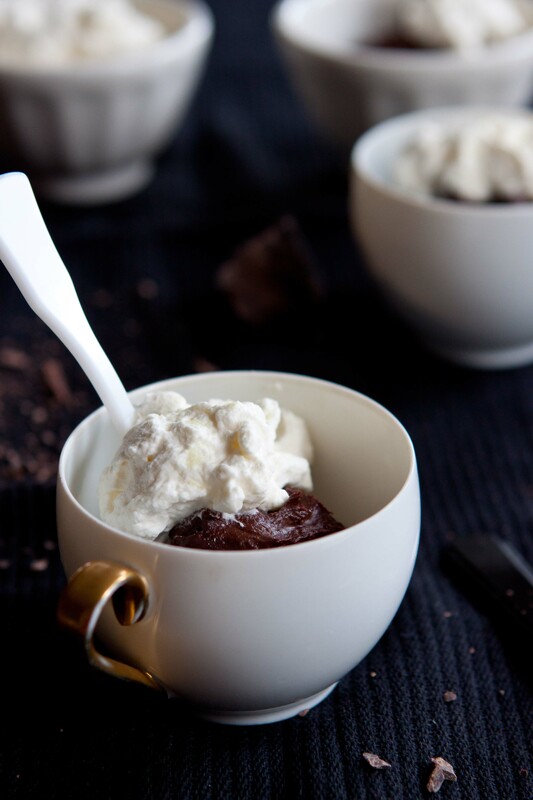 The recipe was devised by food scientist Hervé This who explains that by combining chocolate and water you can achieve a similar balance of fat and liquid as that found in heavy cream. When chilled, heavy cream whips up quite nicely into a thick velvety foam. And so too does chocolate melted into water, it turns out. You have to heat the water and chocolate to get them to mix together, then you chill them swiftly as you whisk by putting your metal bowl (do use metal – it conducts heat away much better than plastic) into another bowl filled with ice. Here is a nifty video of the technique showing just how simple it is. Of course, my process was not nearly that neat and streamlined. My melted chocolate looked lumpy, making me nervous, my ice and water splashed out of the bowl and everywhere as I whisked, but in the end, the result really was a silken mousse. It’s practically a party trick. After dinner, you apologize profusely to your date or your guests because you simply forgot to make any dessert. How sad. Oh, but wait, you have 8 oz. of chocolate lying around, and some ice cubes in the freezer. Five minutes later you have a deep dark chocolate mousse, which you can allow to set for just the time it takes to whip up some cream, and then it’s ready to be served. You can use just chocolate and water to make a plain mousse, but I can’t leave well enough alone, so I jazzed mine up. Inspired by the Black Pearl chocolate bar from Vosges Haute Chocolat, I added ginger and sesame (in the form of finely chopped halva candy). Then, in a moment of boldness, I sprinkled a bit of wasabi powder over the whipped cream. It sounds crazy but tastes quite amazing (Shhhh, I ate one to test it. The rest are in the refrigerator awaiting supper time). The wasabi powder is warm, nutty, and complex, and tastes luscious with the sweet cream. Perhaps wasabi takes the chocolate mousse back out of the trite realm and into the unexpected. Either way, what it is is dark chocolate, and that works for me any day of the year. In a heavy bottomed saucepan, combine the water, chocolate, and ginger. Heat over medium-low heat, stirring, until the chocolate is melted into the water and well combined. Stir in the halva, then scrape into a medium-small metal bowl. Put this bowl into the bowl of ice and start whisking the chocolate mixture. Whisk until thick and about the consistency of whipped cream. Spoon into small bowls and put onto the counter or into the refrigerator to set for just a little while (it doesn’t take long). Note: if you over whisk the chocolate mixture it will become grainy, but all you have to do is reheat it until it melts again, and then try again, stopping a little sooner this time. Allow to return to room temp. if you chilled them. 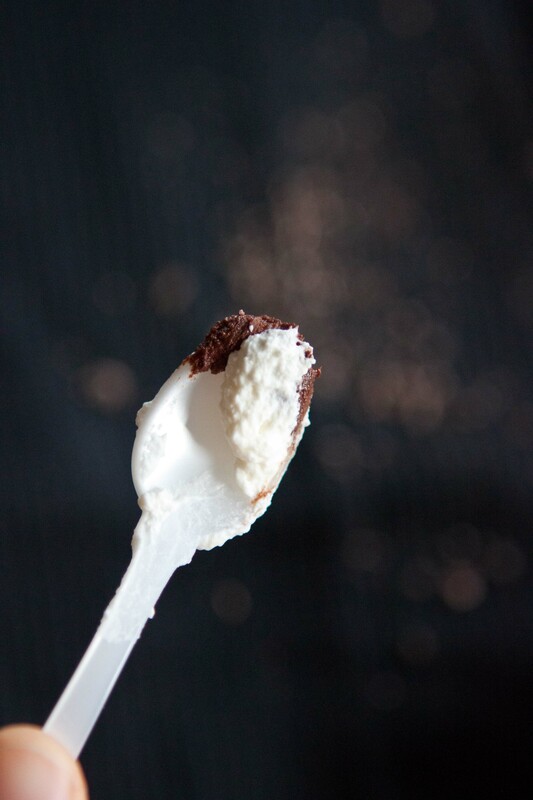 Spoon whipped cream on top of each bowl of mousse, then sprinkle with a pinch of wasabi powder, if desired. Enjoy! It’s intense stuff, so a little serving goes a long way. Well I just looked up the word culinarilydaring (yes, that’s right, one word) and found Emily from Five and Spice! The addition of wasabi blows my mind. And “here here!” to 365 days of chocolate, flowers, and champagne! Hahaha! That is completely amazing. I’ll take it! 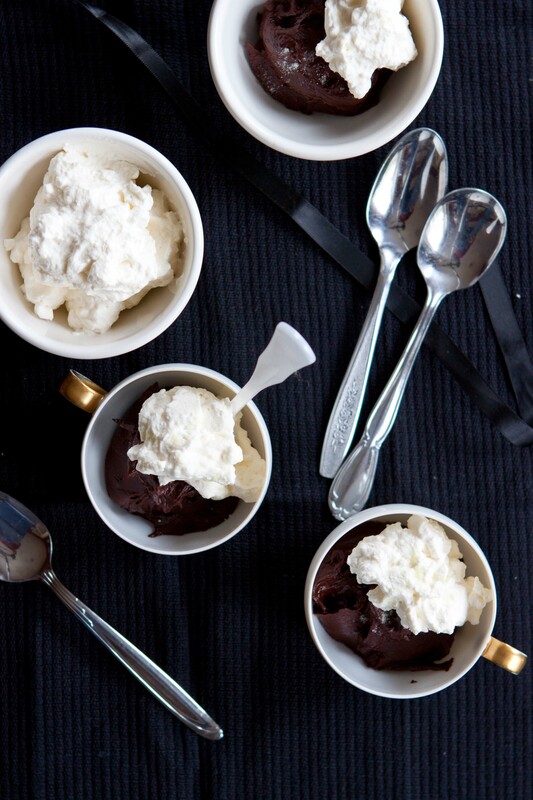 I’ve been eyeing this recipe on Food52 – love your creative additions to the mousse! You’re right, it’s only a matter of time. I think I’ll join in. There’s nothing trite about this at all! You’re very adventuresome with flavors and I love the “party trick” aspect of it all!! Very neat!! Looks like a fun recipe, and how convenient that I have all the ingredients here already (ok, not the wasabi powder admittedly). It’s nice to have “emergency” recipes like this one for days when getting to the store seems about as likely as climbing Mt. Everest! I am going to try this (in capital letters) I watched the video and just stunned by this invention. Brilliant! just brilliant! Isn’t it?! It’s just crazy cool! I knew you’d never guess what it was, hehe! Thanks for sharing this technique. I just watched the video, and can’t wait to try this. The ginger and wasabi are great touches too. We don’t usually do dessert, but had a guest last week, so it was a good excuse to indulge. I substituted 1/4 cup of the water with Grand Marnier, and served the mousse with tangerine (membranes removed) and sprinkled with tangerine zest. The next day we combined the leftovers with the rest of the zest, rolled it into balls, and coated those with semisweet chocolate powder – so the mousse became truffles. It was a nice indulgence. Thanks for sharing the method. Chocolate and water? I had no idea! I love the way you jazzed it up. Sounds delicious! Just tried this one. Delicious! And so much FUN to make 🙂 I just recently discovered your blog, but I am already in love whith it! You are currently reading Sesame ginger chocolate mousse – it was only a matter of time at Five And Spice.